Nicola DiCio’s grin is as warm as the bright September sunshine when we pull into White Oak Farm, the 50-acre farm straddling Hampton and Indiana townships that’s been in his family for three generations. He has a good reason to be happy. Not so very long ago, the large timber-frame barn — the one that next weekend will welcome hundreds to the region’s first-ever Hatch chile festival — was about one good gust of wind from falling down after decades of neglect. Running Reyna Foods, the bustling Mexican food store he owns in the Strip District, left precious time or energy for making repairs. Especially since he also operates a tortilla chip factory on the banks of the Allegheny River in Armstrong County. Eventually, though, the lure of almost 100 years of family history proved too strong to ignore. Three years ago, Mr. DiCio decided it was time to breathe new life back into the farm on which he’d spent much of his childhood. So working rafter by rafter and stone by stone, he slowly rebuilt the rickety barn from the ground up. His eye for detail is so exacting that the bank barn, he notes with a proud laugh, is in better shape today than when it was built in the late 1800s by his Italian grandfather Nicola Domenico DiCio, who worked for the Fort Pitt and Duquesne breweries before becoming a beer distributor. Tempered windows now fill the once dungeon-like space with light. A new French drain promises to keep it dry. And there’s a pretty patch of cobblestone instead of dirt welcoming guests at the entrance.
. This will be the third year in a row Mr. DiCio will truck in and roast fresh New Mexico Hatch chiles for the buying public. But many still are unfamiliar with the long and skinny fruit, which some in the pepper-loving community consider nothing short of a tragedy. 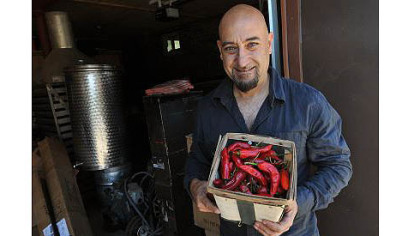 That includes Mr. DiCio, who will sell as many of the fresh peppers as he can get his hands on. “They’re so good,” he says. Having been to Santa Fe in early September, I agree there’s nothing quite like New Mexico-grown green chiles. And no town does it better than the tiny village of Hatch just north of Las Cruces. Known as the “Chile Capital of the World, it’s so famous for its mild- to blistering-hot chiles that up to 30,000 fans gather each Labor Day weekend for an annual two-day chile festival to celebrate the harvest. This year’s gathering on Sept. 1 and 2 marked 41 years. Tickets to Mr. DiCio’s inaugural event cost $5 in advance at reynafoods.com (or $8 at the gate) and what a bang for the buck. In addition to cooking classes and food from local chefs and farmers — Justin Severino of Lawrenceville’s Cure is preparing a special Hatch sausage — the daylong party includes craft vendors and artists, live music, a masa (dough) making presentation, hay rides and chile bobbing and eating contests. Mr. DiCio also will demonstrate how to make ristras, the colorful strings made with freshly picked, mature red chile pods that when dried help cooks spice up their favorite recipes. Can’t make it to the country? Skinned and seeded Hatch chiles will be available for purchase at Reyna, too, after the event, though the market price has yet to be determined. Reyna also sells canned Hatch chiles. Fresh Hatch chiles are hard to find on Pittsburgh menus, so the festival is sure to draw a large crowd. Big Burrito Group, which each August offers a special Hatch menu at its Mad Mex restaurants, already has called it quits, and the Hatch chile burgers at Fuddruckers, should you be up for the three-hour drive to the closest location in Chambersburg, will be equally fleeting. The Pepper Farm Festival is the second public event at Mr. DiCio’s farm, where unplanted fields stretch into the treeline along Wagner Road. During Prohibition, his grandfather hid giant cement vats in the hillside in which he fermented corn mash for moonshine sold in a speakeasy. Until federal agents sniffed their way up the creek, that is, ordered him to stop and then blew the vats up with dynamite.
. “I want to plow the fields by hand, like the Amish,” he says. A serious wine maker who is equally serious about the violin, Mr. DiCio proudly points out a grape crusher with an expandable bladder and an impressive-looking wine press that he stores in the barn. He served some of his homemade reds and whites at an Italian barbecue he hosted with five local chefs at the farm for 100 of their closest friends earlier this summer, and he’d like to do more. “I want to get people more in touch with where their food comes from,” he says, including the school children he’d like to visit the farm. With his blue eyes and Italian surname, customers are often surprised to learn the 48-year-old is half Mexican. His mother, Lydia Reyna, was born in Reynosa, Mexico, and raised just three miles from the Mexican border in McAllen, Texas. She liked nothing better than feeding her family the native dishes she learned to make as a girl, so he grew up eating as many fresh tortillas as he did homemade pastas. “I’d bring them into school, and nobody knew what they were,” he says. Today, his big blue factory in Cadogan cranks out 2,000 pounds each day of some of the country’s best tortilla chips, made via traditional techniques using equipment he designed and engineered. Each day in his Strip District store, workers knead corn masa into hundreds of fresh tortillas. He also sells warm fresh flour tortillas — a simple but perfect wrapping for a freshly roasted Hatch chile. Mr. DiCio got into the Mexican food biz in a tiny storefront in Etna in 1987. The first store of its kind in Pittsburgh, it expanded so quickly that within a year he’d relocated to the Strip. A year later, he opened his chip factory. He moved to his current location at 2031 Penn Ave. in 2008, and sometime early next year will open a restaurant in the lower level serving the traditional Mexican food Pittsburghers increasingly hunger for. 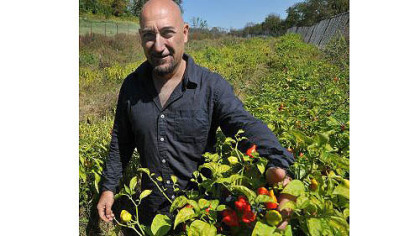 Nic DiCio is growing pepper from Hatch seed on his farm in Hampton. The festival, he says, was a natural outgrowth of the wildly successful Hatch green chile roasts employee Linda Jones cooked up in front of the store the past two years. Still, he had to compromise on the name, agreeing to call it a pepper festival instead of a Hatch fest so people wouldn’t be scared off. Hatch doesn’t refer to the cultivar, Mr. DiCio explains, but rather the region where the pepper is grown. It’s a serious distinction: A new state law that went into effect in July prohibits vendors from labeling their chiles as New Mexico chile unless the peppers were grown there. Planted in April, the first Hatch chiles arrive in mid- to late-August. If it’s a good growing season — and this year was — you can buy the fresh chiles through the beginning of October. Hatch aficionados say the fertile volcanic soil of the Rio Grande Valley, coupled with the hot days and cool nights, are what give Hatch chiles their culinary edge. They’re best enjoyed roasted, a process that loosens their tough green skins and brings out their flavor. If they’re red, that means they’ve ripened in the field and developed an almost smoky flavor. But those generally don’t get roasted: the dried pods either are ground into a powder for seasoning and sauces or strung into ristras. In New Mexico, chile peppers are roasted in wire cages heated by propane gas in parking lots and roadside stands, driving anyone within wafting distance bonkers with the pungent, delicious smell. So Mr. DiCio will fire up a big mesh barrel just outside his barn, too. He’ll roast 25 pounds at a time, continually turning the cage until the crackling, snapping peppers lose their skin. Be sure to breathe deeply. 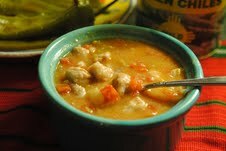 This fragrant, flavorful stew is probably the most famous dish made with Hatch green chiles. Serve with fresh flour tortillas from Reyna Foods in the Strip District. Even my father, whose tolerance for spicy foods is limited, thought this dish was terrific. 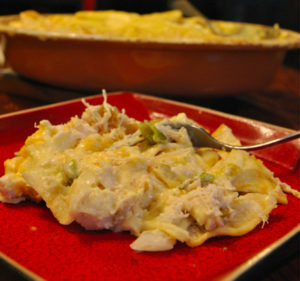 To cut down on cooking time, use shredded breast meat from a rotisserie chicken. 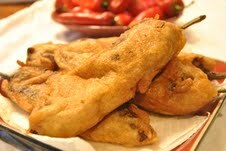 Make sure the oil is really hot, or the rellenos will take too long to cook and get greasy. Smother in salsa and serve with lettuce and tomato. If you can’t find Hatch chiles, substitute poblano or Anaheim. 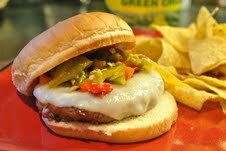 First offered on local menus in the mid 1950s, green chile cheeseburgers are so popular in New Mexico that the state tourism department has developed an official “green chile cheeseburger trail” of restaurants, drive-ins and dives offering them (newmexico.org/culinary). Don’t worry about them being messy — it’s expected. The hotter the chile, the hotter the salsa. So choose a mild cultivar like NuMex 6-4 Heritage, from a long line developed by New Mexico State University, if your taste buds are timid. There’s no culinary law you have to roast a Hatch, or any other New Mexican chile, before eating it. But they sure taste better that way, and besides, it’s really easy. The real problem is getting your hands on a couple of pounds without breaking the bank. (You can find them a few places online, but it’ll cost you.) Here’s how: Wash and dry chile. Place chiles under a broiler or in a 450-degree oven for 6 to 8 minutes, or until skin is charred. Or roast them over an open flame on your stovetop, or on a hot grill, turning the chiles every few minutes, until the skin is black and blistered. Place chiles in a plastic or paper bag (use tongs so you don’t burn your fingers) and close the top; the steam will loosen the skins. When chiles are cool, remove them from bag, and remove the skin with your fingers. (If it gets too messy, run water over your hands and not the chiles or you’ll lose all that good smoky flavor.) De-stem (unless you’re making rellenos,) scoop out the seeds and then chop the silky flesh into small pieces (that freeze for a year).